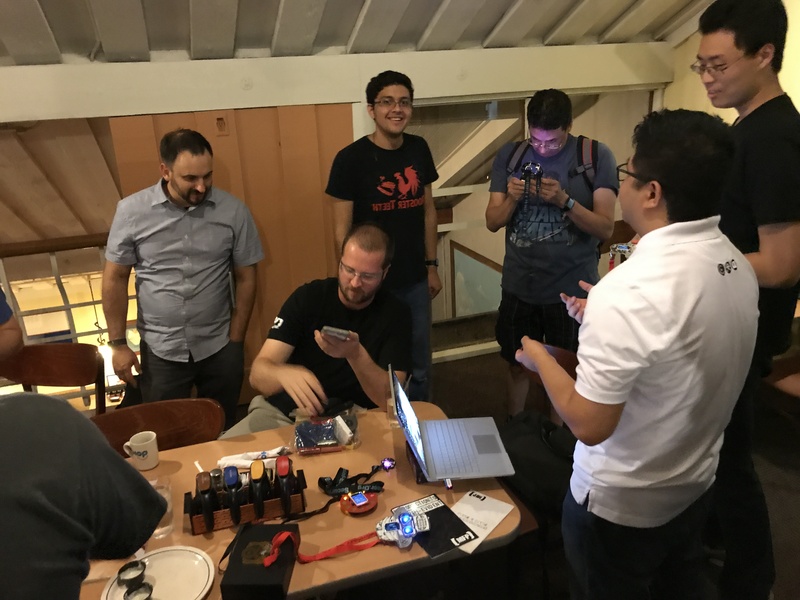 Another great showing for our pre-meet up as well as the actual meet up! The group seems to be getting larger and larger every time. 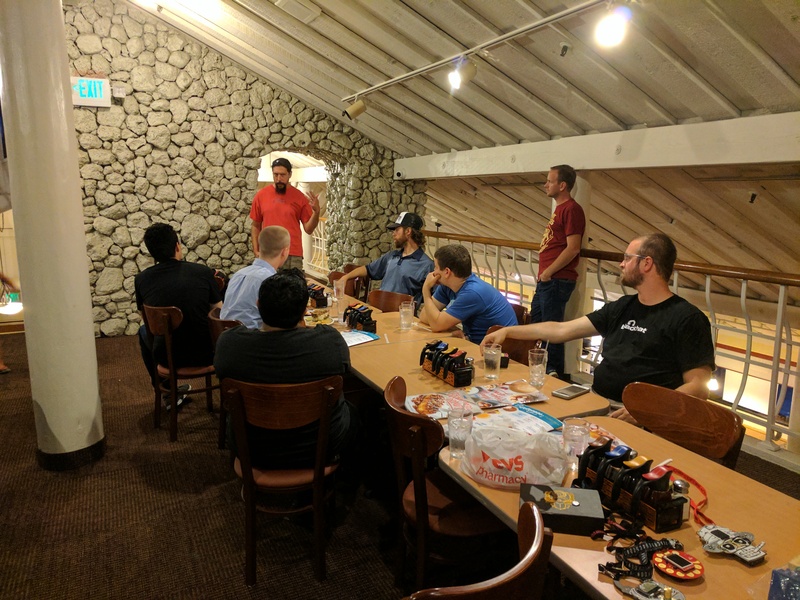 This month’s meetup covered a few topics: Epic Role, Tamper Evident, and Badge Life. Our special guest Pappy stopped by to show off his board game Epic Role. 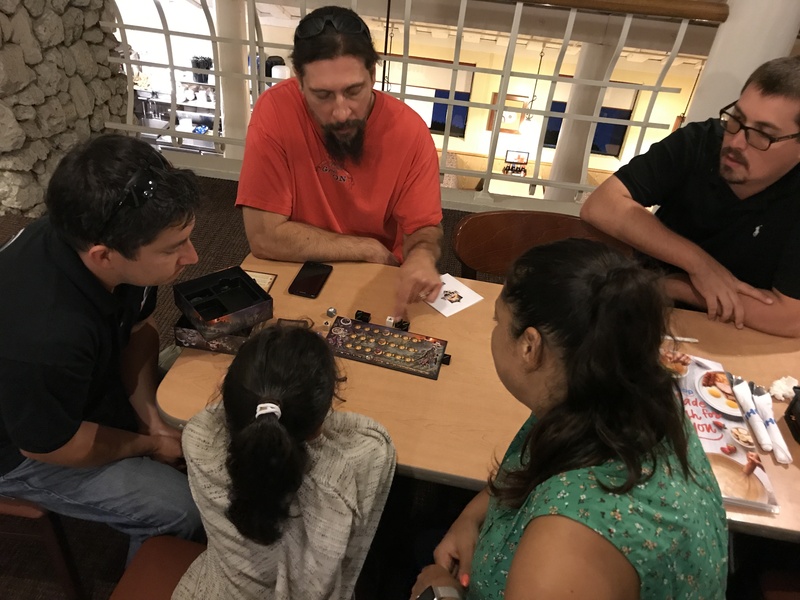 Epic Roll is a quick-playing, dice-based, fantasy board game that is portable and simple to learn while also providing players with numerous strategic decisions and gambles. Pappy described his thoughts behind the game and how the primary goal behind Epic Role was to merge ideas and thoughts of other games to make something that was quicker and easier to play. The conversation quickly turned to logistics behind game making. 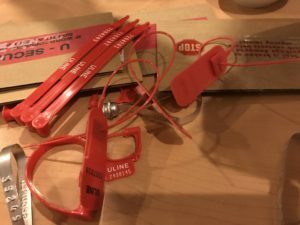 The discussion of marketing, manufacturing became quite interesting as we learned of some of the difficulties behind making and shipping the product as well as how shelf space works for the retailer. Some deals could garner you space with the front of the box showing, where other deals may only allow the spine to be visible from the store shelf. Because of this fantastic artwork was crucial. Having box artwork that looked enticing from the spines as well as the cover was greatly needed. Also with this great artwork was needed for the cards! Pappy also mentioned that finding good artists is valuable. Artists can be like magicians and disappear if you’re not careful! After Pappy finished his talk we had smaller discussions at the other end of the table around the Tamper Evident village and Badge Life at DC5. Sloth, Yaxis, and Tuesday brought in some of the leftovers from Tamper Evident and spoke briefly with those curious about the Tamper Evident Village. 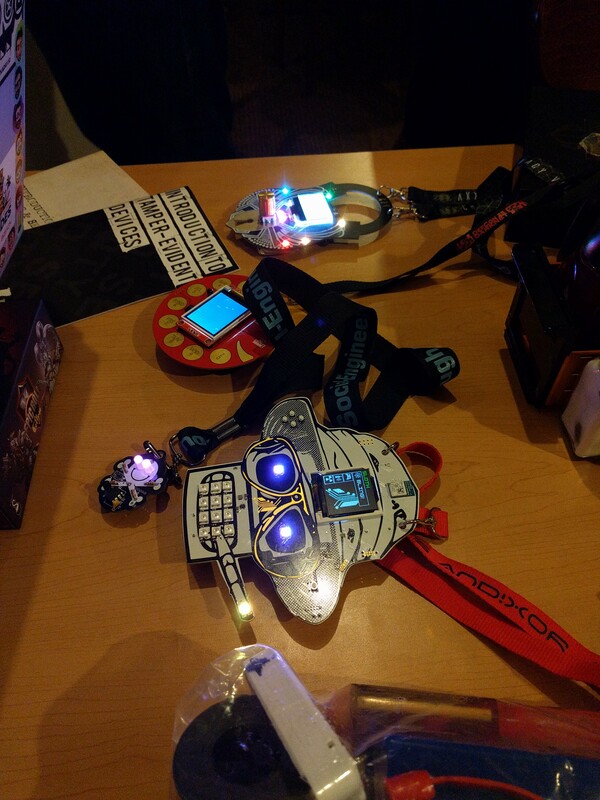 They also brought in some of the new and shiny badges from DC25 to talk about the latest trend of Badge Life. This included the Bender badge and talks about the interconnectivity of the badges at the conference. 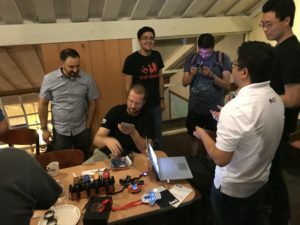 At our September meet up, we will be hearing from our very own JonathanWash. JonathaWash will provide an overview of password managers, what’s out there, and some best practices of use. It looks like it will be a fun discussion. Next IVU meet up is September 8th 2017. Hope to see you there!